The 24th annual Harvard Ig Nobel Prizes were awarded to courageous trail-blazing scientists who pushed the limits of curiosity and credulity during the past year. Among the winners of the 2014 prestigious momento were a Canadian who won the Neuroscience Prize “for trying to understand what happens in the brains of people who see the face of Jesus in a piece of toast” while the Psychology Prize went to an Australian “for amassing evidence that people who habitually stay up late are, on average, more self-admiring, more manipulative, and more psychopathic than people who habitually arise early in the morning.” In their good company was a group of four Japanese researchers headed by Kiyoshi Mabuchi. That team’s winning Physics paper was Frictional Coefficient under Banana Skin. In other words, they studied the effect of slipping on a banana peel. Equipment included a shoe, a banana, and a linoleum floor. Apparently “polysaccharide follicular gel played the dominant role in the lubricating effect of banana skin after the crush and the change to homogeneous sol.” The elusive coefficient of friction was measured at 0.07. Ah, but didn’t the MythBusters already do that? Perhaps, but Mabuchi et.al. used more math. The TV guys busted the myth – they found that it is hard to slip on a banana peel. They discovered that the slick underside of a fresh banana skin has some slippery properties, but things don’t get comedic until a pile of over-ripe banana skins are enlisted. To get a laugh, you need old rotten skins stacked like pancakes. Those old peels need to decompose into a soft slimy slippery texture. If banana peels aren’t inherently slippery, how did they earn their sidekick reputation? And why did Mario’s Kart expel them as infinite point-stealing weapons? The story goes back to 1866 when Carl Frank started importing bananas from Panama into New York City. They were a novelty and sold at the 1876 Philadelphia Expo as if they were corn dogs. Soon people everywhere indulged – and discarded the peels on the street. In those days, big cities were filthy – the whiff of sanitation was not yet in the air. Thirty years later, civic leaders were admonishing residents that their dirty throw-away habits were leading to broken arms and legs. And very lame vaudeville skits. Litter laws were enacted and trash removal was started, resulting in less hazardous streets. But the slippery-peel comedians thrived anyway. Although Mabushi et.al. worked out the friction coefficient for soles skidding on peelings, it was actually the MythBusters who gave us a good experimental, qualitative approach. Alas, there are no Nobels (Ig- or non-Ig-) for television stuntmen, regardless their lofty talents and achievements. Nevertheless, experimental and qualitative investigation is closer to the heart of the average geologist trying to understand how rock layers slide atop one another. And that’s where this blog is heading. 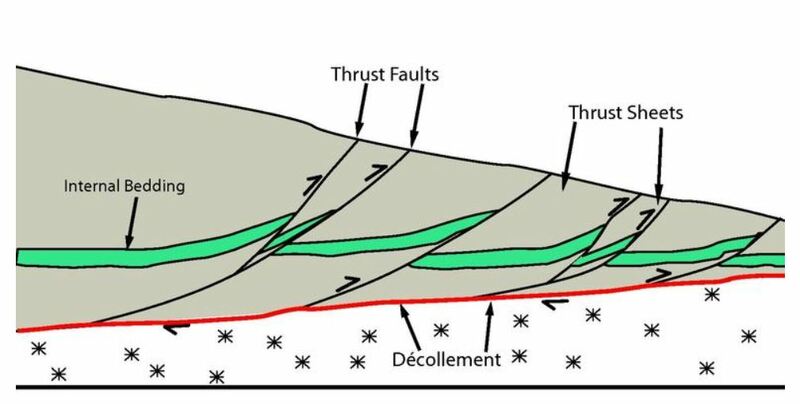 In the 50 years since mountain building was recognized as the result of colliding tectonic plates, thrust sheets have been understood in their true context. As crustal rocks crash together, some wedges slide up and over others. They tend to do this along a décollement, which is a (relatively) slippery zone between different rock types that allows detachment for rock layers that decouple and move independently. You can see how that works in this cartoon. When compressional pressure squeezes this structural model, the slippery-as-a-banana layer slides along the décollement, the weakest link in the system. Layers get stacked, leading to crustal shortening. This phenomenon was first noticed in the Swiss Jura Mountains in 1907. Geologists there speculated that if all the Swiss stacks could be decompressed and returned to their pre-thrusted positions, Switzerland would be the largest (and flattest) country in Europe. 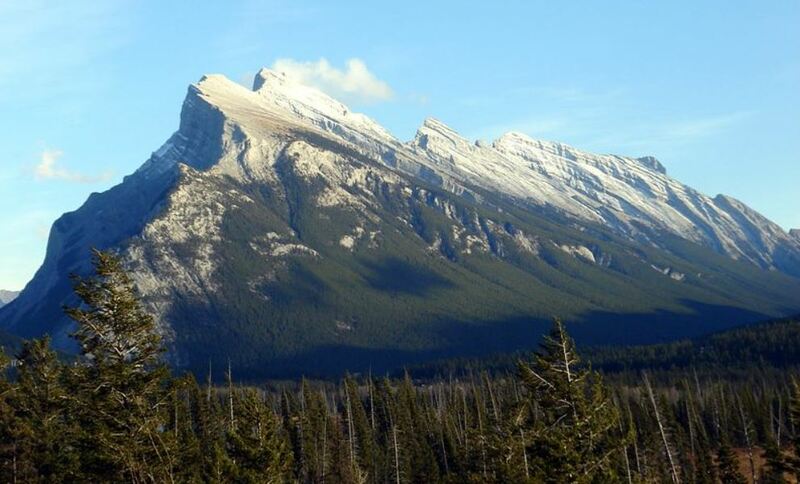 Meanwhile, closer to my Canadian home in Calgary, I can spy a few similarly stacked peaks from my living room window. These mountains were build as the Kula Plate rammed into the North American Plate and rocks folded, detached, and thrust above the plains. But these rocks didn’t break loose and slide without spending a bit of time resisting the urge to move. Just like the shoe on the banana peel, there is a coefficient of friction involved. Turcotte and Schubert, in their book Geodynamics (pp 352-353), do the math for us. In lab tests, the coefficient is about 0.85. 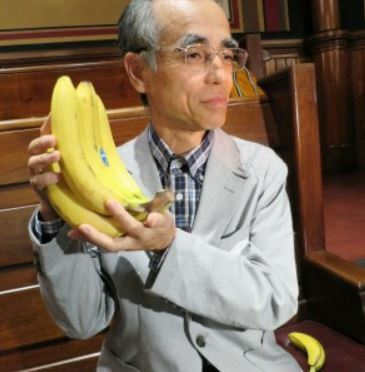 But surprisingly, they discover that the addition of water in porous deeply buried rock layers reduces the frictional force to a coefficient of just 0.o6 – almost exactly the same as Mabuchi’s shoe on the fresh banana peel. Granted, the weights and forces get bigger when it involves mountains rather than fruits, but the skidding principle is the same. This entry was posted in Culture, How Geophysics Works, Plate Tectonics and tagged banana peel, Canada, geology, Ig Nobel, mountain building, mountains, plate tectonics. Bookmark the permalink.